Looks great! Got to look for one like that.. 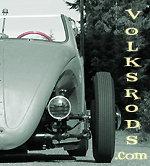 The beetle rear upper shockabsorbers was in an early stage of the projects life lost. In the beginning it even had the torsionhousingtubes shortened but was returned to stocklength again shortly after.. The towers were removed in the same process because I was told that they limited the lowering of the suspension due to the IRS crossbars.. I had to try out an other solution today. Then cut just the top of the loose shocktower including the original bodymount. Was planning to weld a new bodymount for it when I finish the floorpan. Noticed that the bottom of the cutdown shocktower still was very close to the IRS crossbar. Decided to try out how it works so I mounted a wheel and lifted the wheel and suspension as much as I thought necessary. I have a T4 going in my Volksrod. Mid-engine to boot! How is the front done? Is it a standard beam or something else? Upper rear shockabsorber mounts done and ready to be welded. Got the uppermounts for the rear shocks fixed in correct position and angle by the help of the jig I made. Previous owners had removed the complete towers including upper shockmounts due to big loweringplans. Here fixed with the jig. Not that much of a progress but atleast I finally got the bodysupport/doorsills welded a couple of weeks ago. Including the doorpillars. Decided to straighten it out with my stretcher.. Finished logo. Still need to cut the edges round. Rolled it out in the nice two month early spring sun while grinding all areas needing welding. Slick work! The badge is very cool and...wait a minute, those are four lug wheels! ...wait a minute, those are four lug wheels! How much space do I have when helpframe is finished...? No!! Stay focused!! Stay focused!!! 6? He's got room enough for an eight! I mean, um, no, no, the four will be just fine. Inspect, plate, swap engine, drive. Repeat as needed. Its only illegal if you get caught.